2019 standard 61 - reissue? Discussion in 'Gibson SG' started by Robert Morris, Nov 6, 2018. Is this a reissue without the name. The differences I see between this and the Standard are vintage tuners, neck joint at the 22nd fret, and the 61 Burstbuckers. Am I missing anything? The crown inlay on the SG Standard ’61 2019 is not positioned at the correct location for a '61 Reissue. They placed it at the same location as 1965-present SG Standards. At the end of the day, both guitars do the same thing. Thanks Where did you find the information on the inlay? I have the mental capacity to facilitate such things. In the past, I had a 2009 SG 61 Reissue. It used to be that one could differentiate between an SG 61 Reissue and SG Standard with small guard by looking at the headstock. The SG 61 Reissue had a wider headstock and the crown inlay is positioned closer to the headstock logo compared to the regular SG Standards. Look at the baseline of the crown inlay in relation to the middle tuner posts on each model and all will be revealed. An SG 61 Reissue is technically an SG Standard, it's just a special kind of SG Standard, a tribute to the originals that were produced in 1961. The 61 reissue should be a one piece body. I thought glue makes all SG bodies one piece. To the OP: yes, it's basically a '61 RI, just with the narrower headstock of the Standard and '61 humbuckers instead of '57 Classics. Pretty sure my '61 reissue is a one piece body. Bettyboo and pancake81 like this. Yup mine is too. I am pretty sure they all were for a long time, but I am not certain it’s a sure thing anymore. The price increase over the Standard really leaves me personally with 0 interest in it. You would have to really, really know your SG's to even notice it was the new 61 model. And it is not even an accurate 61 model at that. The crown inlay on the headstock is located at the same position as the regular Standards from 1965-present. That was once a distinguishing feature to identify which era an SG was produced or which era it was a reissue of. Not that it bothers me, I just can't help but to notice details with most things and I do realize that reissues are not intended to be exact replicas of the original models and usually contain updated features. Reissue: make a new supply or different form of a product available for sale. So the only details on this 2019 model that resemble a 61 reissue are the neck joint and bevels and I could care less about either of those features. At the end of the day an SG is an SG. bwotw and rich85 like this. With the 2019 line up, I completely agree. It used to be the standard, and then the 61 re-issue. 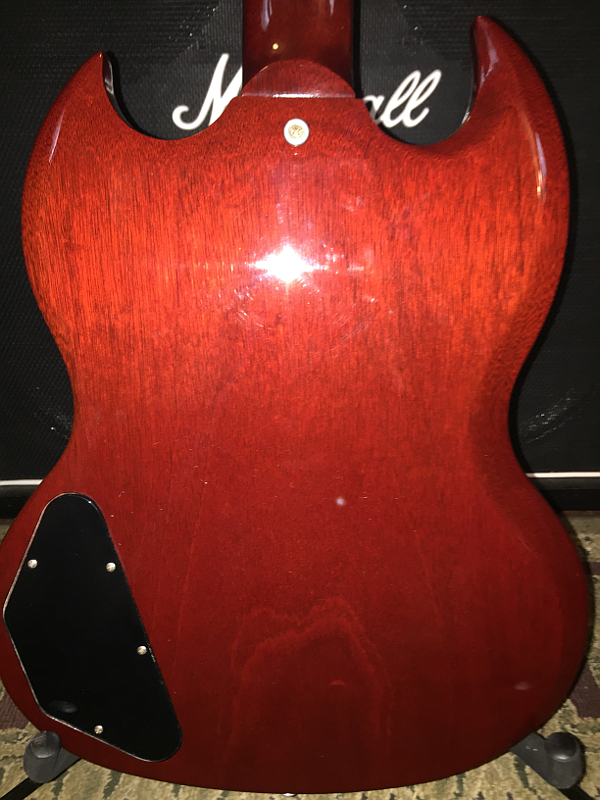 This came with the 57’s, nickle hardware, abr1, large headstock, correct holy inlay, angel wing (small) pickguard and was a 1 piece body. For the 2019 line up you basically have a standard, and a 61 inspired standard. Both having the small guard makes them even more similar to the average person. The 2019 SG Standard has a batwing, not small guard. 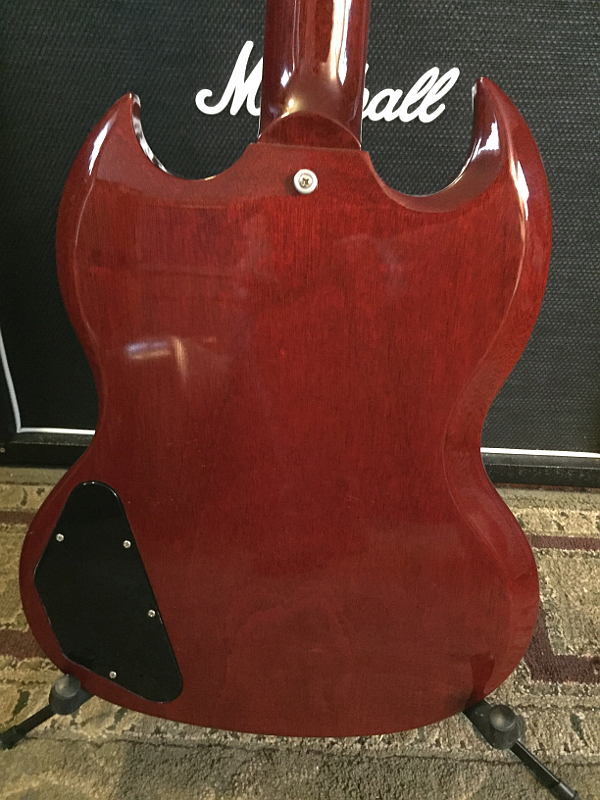 If you are looking for an SG, GO GO GO ! Still, the 2018 Standard has the small guard and the same pickups as the 2019 61 model. I ordered a used 2019 standard 61 from GC for $999. W/OHSC Should be here by Monday. I got 45 days to decide if I’m keeping it. It’s going straight to my luthier who actually used to work for Gibson. PermissionToLand, Bettyboo and Dale like this. Bettyboo, bwotw and Dale like this. This SG has me a li'l baffled, its the same as the 2018 Standard (NO?). The 2019 SG Standard is the 2016 SG Standard with a $300 Price Increase (and STILL NO Hard Shell Case! ), and then there is this one, and IDK, Gibson USA is not calling it a Re-Issue and I'd have thought it was the 2017 SG Standard but it hasn't got the Locking Grover T.M. 's and has the '61 P-Up's instead of the '57's and the ABR. I stayed away from this one and wish I'd have bought two 2017 SG Standards @ $1299.The 2017 SG STANDARD was the best SG STANDARD in decades(IMO). I did see the 2019 SG STANDARD 3 P-up w/Sideways Tremolo offered as an On-Line EXCLUSIVE (-$600 from 2015 @ $1999) and I ordered one and the two I was sent were defective so I ended up getting the 2019 SG Standard w/MAESTRO an ON-LINE EXCLUSIVE as well, and it is BAD-A$$$(My Avatar Picture) !! It surely is, u know? but for $2 Grand it better be !! !